Sometimes what you plan doesn’t happen. I had planned to do whimsy paintings for SOC, in line with my ICAD work. I was mucking around with my acrylics on an old painting trying to work out how to combine the colours of Citrus Green and Turquoise, this week’s colours for SOC, when the lovely above appeared. I thought she fitted the quote from the poem I am using; I just had to enter her, even though she's an old painting, I have given her a new look and some poetry to dance to. Take a look at what all the others are doing with the scrummy colours of Citrus Green and Turquoise at Kirstin’s Summer Party. Why not join in? Linking with Kirstin of Twinkle, Twinkle LikeA Star fame and her Party Summer of Colour. AWESOME! I love her.. my fav palette of colors and a like this quote Sharon! WOW, She is gorgeous & mystifying :). What amazing coloring & brush strokes. LOVE!! She's wonderful! I love her attitude and the color combo is just perfect for her. Your plans may have changed but I love this piece and its vibrant colour combination! She is so cool! The colors look great on her. Oh my gosh, this painting is more than stunning! I really love, love, love her! 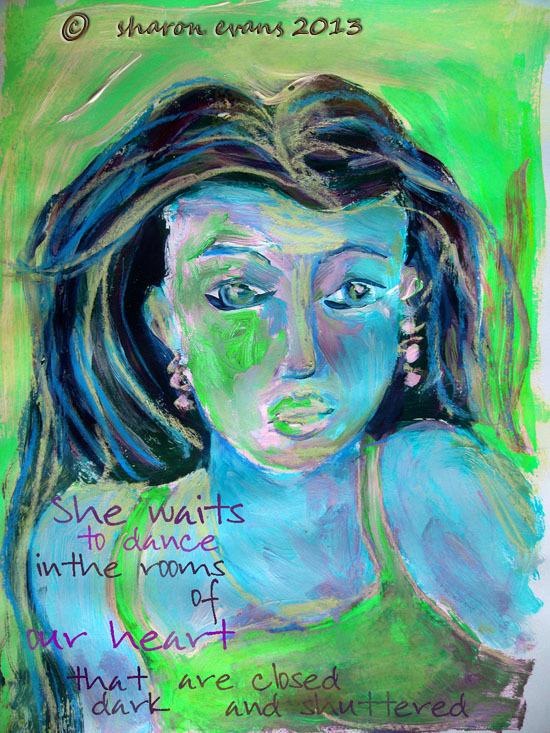 Sharon, I love the brushstrokes, the colours, the quote, just every single detail! I wish I could paint like that, that's exactly the style I love so much. Fabulous use of the colours, Sharon! she is just wonderful Sharon-and I love the quote fro her too! She is so beautiful! I love everything about her . . . and her earrings! Your quote is awesome, too! Thank you for sharing this with us! This is stunning, Sharon! I am in awe of your artistic painting skills! Love this beautiful lady and the quote is perfectly suited to her. Wow, a great painting. She looks really good in those colours, and I love the quote. Beautiful page, I love the suggestion of movement in your painting! I just love her - who'd have thought those colors would make such a lovely portrait! She is most fabulous! I love her, absolutely stunning. Love this girl. Her hair and the colors on her face have been done so well. Gorgeous piece! I've been browsing through your blog and really enjoying it. Your artwork is wonderful! I'll be visiting again. This is a wonderful dreamy lady! I love her earrings! And her wonderful hair! She's wonderful! I love to mess around with paint and such and something wonderful just comes out!